brandflakesforbreakfast: the sweet smell . . . of the subway? the sweet smell . . . of the subway? Costs to ride the NY subway have increased over the last few years, yet cleaning staff has decreased . . . significantly. And, well, if you've ever ridden the subway, you know cleaning is one area they should NOT be cutting back. Ya know, because no one loves the smell of urine in the morning. 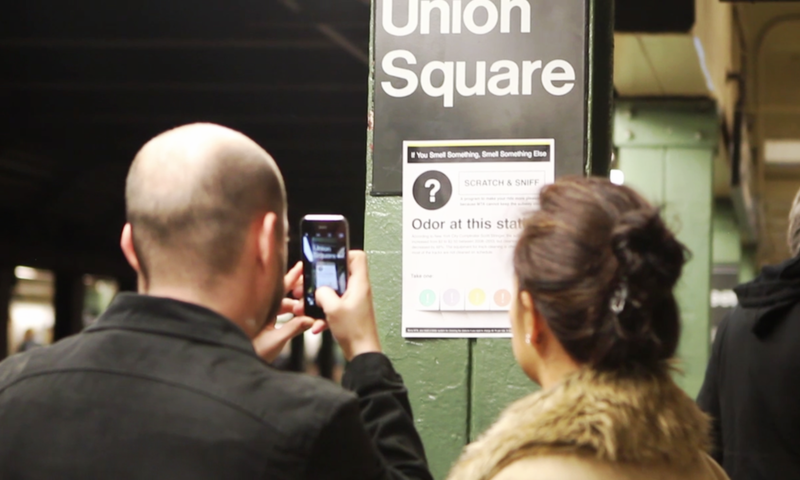 It was exactly this, that inspired Angela Kim to create these amazing scratch and sniff posters for subway riders as part of a SVA school project. 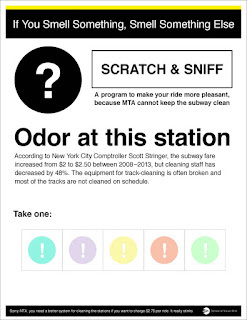 Riders can take one of the scratch and sniff stickers to smell something more pleasant, while learning about the problem at hand. That doesn't stink.